Times are tough in South Africa, the only country on the globe with slower broadband speed than the USA. 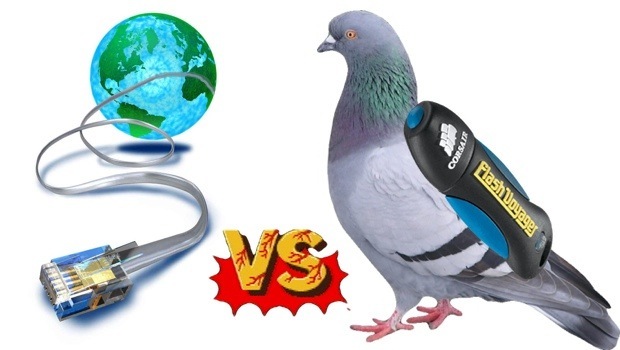 There, the preferred protocol for large file transfers is HSPDA — no, not HSDPA, I mean High Speed Pigeon Drive Attachment. How many times I’ve thought of doing this! But alas, my pigeons only travel to my secret base on Solitary Island and back. At any rate, they released the pigeon and started the upload. I don’t know how many of you guys out there had (or still have) ADSL, but the upload rate was pretty much like wrapping each one and zero individually and delivering one to your recipient on each major holiday. Seriously. And apparently it’s no different in Howick, because the results are pretty ridiculous. The pigeon, Winston, arrived at the destination in Durban in an hour, and subsequent transfer of the data took another hour (what are they using over there, LC2s?). At that point, the ADSL upload was at a whopping 4%. Ah, newfangleness. You are forever being shown up by the old school. Telkom claims it isn’t responsible for the slow speeds, but if they’re not, who is?